FreeFrom Eating Out Award Shortlist announced…. Have you tried any of these (possible) Award Winning Eateries…? As a judge of the FreeFrom Food Awards, I was excited to join the panel for the FreeFrom Eating Out Awards this year. Spread across several different categories (Cafes, Coffee shops and Tearooms / Cafe Chains / Fish and Chip shops / Pub Restaurants / Independent Restaurants / Corporate Hospitality & Venues / Food Services / Schools, Colleges & Universities and B&Bs & Guest Houses. It is a great way of finding new venues to try and have some confidence that they will cater for Coeliacs. The FreeFrom Eating Out Awards were launched to raise awareness of the huge opportunities offered by ‘freefrom’ food within the food service sector now that the new allergen regulations affecting food service have come into force. If you’re interested, the awards, have their own Twitter account – FFEatingOutAwds – and their own Facebook page. Cafés, coffee shops and tearooms – sponsored by Can I Eat There? The presentations will happen at the Food Matters Event in Excel on November 22nd 2016. Excellent post.. Thanks for sharing such helpful post.. 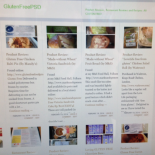 This entry was posted on October 18, 2016 by glutenfreepsd in News & Views, Restaurant Reviews, Travelling Gluten Free and tagged FreeFrom, FreeFrom Eating Out Awards, FreeFrom Food, FreeFrom Food awards, Gluten Free B&Bs, Gluten Free Cafes, Gluten Free Fish and Chips, Gluten Free Restaurants.